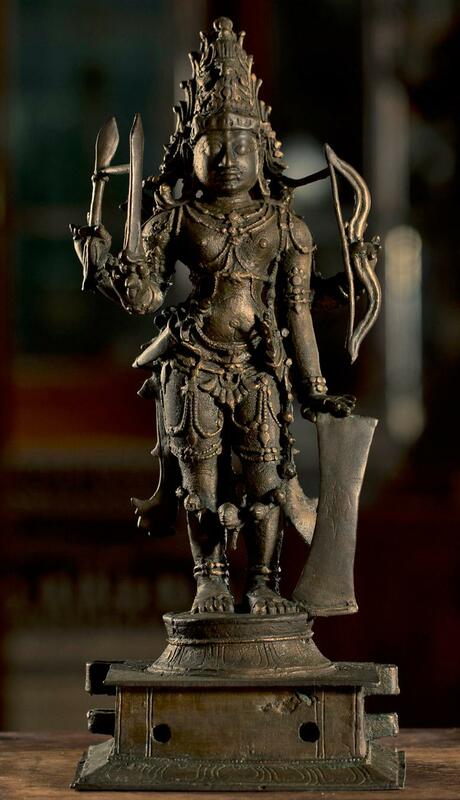 Veerabhadra is a form of Lord Shiva. Shiva took this form when his father in law refused to invite him to his great yajna (sacrifice). Sati his consort, insisted on going to her father’s house and when she was not welcomed, in shame she committed suicide. When Shiva heard the tragic news of her death, he transformed himself into a giant (Veerabhadra) with several heads and many arms and destroyed the yajna in order to avenge his wife’s death. The figure has four hands. The headdress of this image is highly decorative. The hands carry the usual weapons. A garland of skulls and other ornaments are also visible.